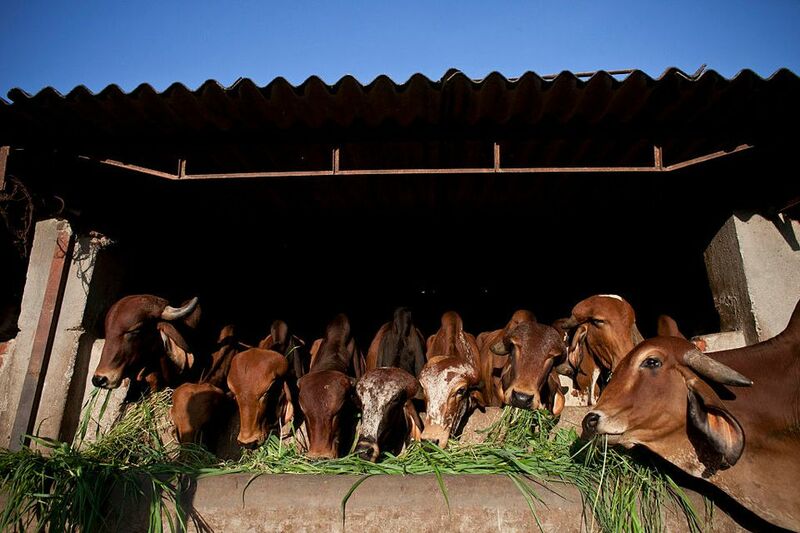 Buried deep in the bustling bazaars of Bhuleshwar, in south Mumbai, there's an unexpected treasure -- a two acre shelter that looks after hundreds of cows, as well as other rescued stray animals and birds. It's well off-the-beaten-track and and despite living in Mumbai for many years, I never knew about it. However, after seeing it mentioned in Fiona Caulfield's Love Mumbai Guide, I decided it include it on the sightseeing itinerary for a friend who was visiting me. The entrance to Bombay Panjrapole is down a lane surrounded by shops selling saris and other fabric. It's easy to miss (and indeed we did initially miss it). You could spend the day shopping in the area and never come across it! Inside, there is such peace, it feels more like being in the country rather than one of the most crowded cities in India. Bombay Panjrapole was established way back in 1834 by businessmen Jamsetjee Jeejeebhoy and Amichand Shah, with the assistance of Parsi philanthropist Cowasjee Patel. The intention was to look after stray dogs and pigs, which the British had ordered to be shot at night. The cows were brought in to produce milk to feed the strays, and were secondary. However, over time, they've multiplied and become the main attraction. And, they are totally adorable! The baby ones, with their gigantic floppy ears, reminded me of dogs rather than calves. They clambered for attention and were keen to be hand fed. These days, Bombay Panjrapole looks after more than 350 cows (some of which are disabled) plus other strays such as donkeys, goats, rabbits, parrots and ducks. If you've got small children, they'll especially love Bombay Panjrapole. It's also grown to have special religious significance for Hindus, who believe it's auspicious to feed cows. Despite there being plenty of food around, some of the young calves looked quite skinny though. Perhaps they'd been ill. Numerous signs stated that food from outside was prohibited, as the animals were falling sick due to excessive feeding. (You can buy grass to feed them there). Bombay Panjrapole is located in Panjrapole Compound on Panjarapole Road in Bhuleshwar, near Madhav Baug post office. It's open daily from 7 a.m. to 1 p.m. and 2 p.m. to 6 p.m.
Want to take a tour? Bombay Panjrapole is included this Mumbai Bazaar Walk, offered by Mumbai Magic. Alternatively, those who are feeling energetic can see Bombay Panjrapole as part of this early morning bicycle tour of Mumbai, conducted by Reality Tours & Travel. More information, including a map, is available on the Bombay Panjrapole website. Bhuleshwar is a renowned Mumbai market district. In particular, the area around C.P. Tank (Cawasji Patel Tank) is notable for its exquisite bangles and imitation jewelry. You can stroll south all the way to Crawford Market in about 20 minutes. On the way, you'll pass by other famous markets such as Mangaldas cloth market and Zaveri Bazaar gold market. Plus, two significant places of worship -- Mumbadevi temple (which the city was named after), and Jama Masjid mosque (where the city's oldest Muslim community worships).